Then the answer is - YES I want to try it! For those who don't know, although I wear a CGM (continuous glucose monitor) , T1Ds still have to test their blood sugar with a finger stick. Using a CGM lowers this number, but I'm still testing 6-10 times per day. After coming across some reviews on the Genteel, and looking at my callused/scabbed finger tips I decided that this new gadget was something I needed to try! Did it meet the above criteria? YES, and exceeded in many ways! This gadget comes in a variety of colors and I decided on Playful Purple. Upon ordering, I was sent a welcoming email with a "How to" video which was most helpful! The box arrives a few days later, and I discover that I can PERSONALIZE my Genteel..... ok hold up.... 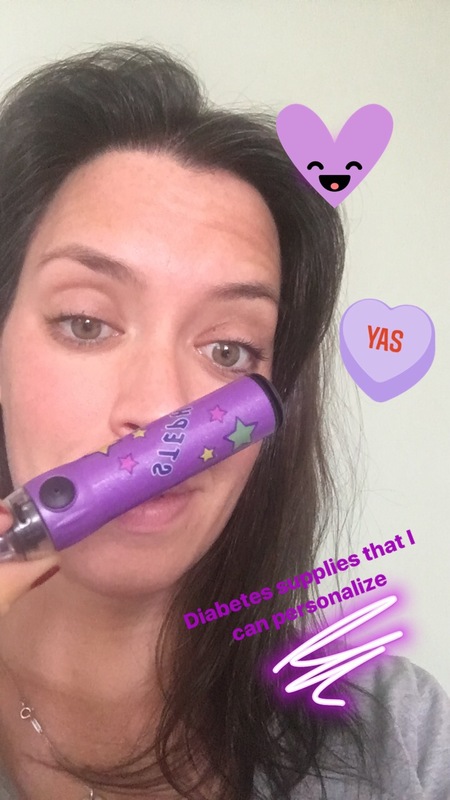 I can decorate my diabetes supplies with stars and unicorns??? HECK YES! For those curious - insurance does cover the genteel and they also supply a form for you to submit to your company if needed! There is also a 120 day satisfaction guarantee! What are some of your favorite D-gadgets? ?